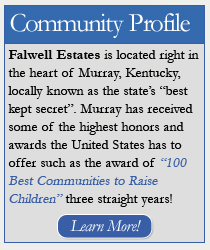 Falwell Estates is a 52-acre restricted residential community nestled in one of Murray, Kentucky’s most desirable locations in Southwest Calloway County. 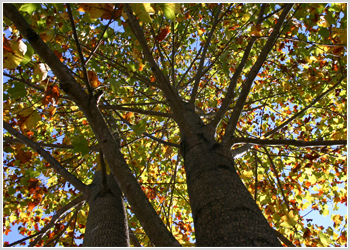 The community is made up of 61 lots ranging from; one-third, one-half, three-fourths and one acre. It is located on gently rolling terrain just three miles from the Court Square. The scenic development provides quick access to highways and is in close proximity to shopping, dining, hospitals, recreation and downtown, allowing its resident to enjoy country charm and city convenience. Families with children have a choice of two excellent school systems. The development has much to offer active families and retirees. Nearby attractions include Murray State University, Lakeland recreation, Land Between the Lakes, community theater, citywide Freedom Fest and much, much more. Restricted to 2,200 square foot minimum homes and with affordable pricing, Falwell Estates offers more than just a house or piece of real estate. It’s the place for you to build your dream home. Call us today at (270) 753-9250 to learn more. 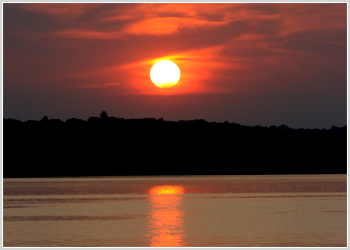 With no current through traffic, Falwell Estates offers comfortable living in scenic surroundings. The development has underground utilities and fiber optics, provided by New Wave Communications, for its future residents. Falwell Estates gives you the chance to experience the 52 acres of natural beauty tucked in the rolling hills of Murray. It’s the perfect place to call home.